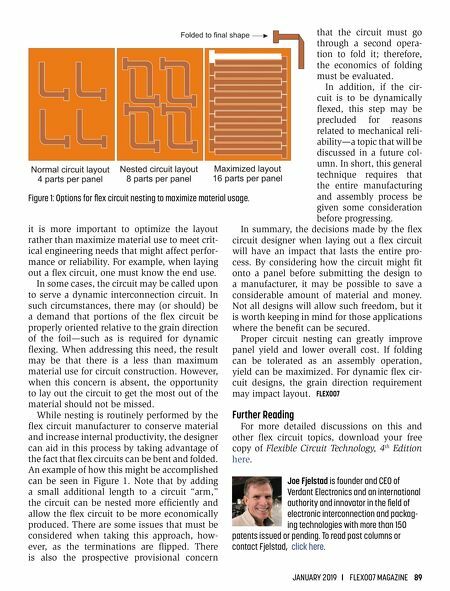 JANUARY 2019 I FLEX007 MAGAZINE 89 it is more important to optimize the layout rather than maximize material use to meet crit- ical engineering needs that might affect perfor- mance or reliability. For example, when laying out a flex circuit, one must know the end use. In some cases, the circuit may be called upon to serve a dynamic interconnection circuit. In such circumstances, there may (or should) be a demand that portions of the flex circuit be properly oriented relative to the grain direction of the foil—such as is required for dynamic flexing. When addressing this need, the result may be that there is a less than maximum material use for circuit construction. However, when this concern is absent, the opportunity to lay out the circuit to get the most out of the material should not be missed. While nesting is routinely performed by the flex circuit manufacturer to conserve material and increase internal productivity, the designer can aid in this process by taking advantage of the fact that flex circuits can be bent and folded. An example of how this might be accomplished can be seen in Figure 1. Note that by adding a small additional length to a circuit "arm," the circuit can be nested more efficiently and allow the flex circuit to be more economically produced. There are some issues that must be considered when taking this approach, how- ever, as the terminations are flipped. There is also the prospective provisional concern that the circuit must go throu gh a second opera- tion to fold it; therefore, the economics of folding must be evaluated. In addition, if the cir- cuit is to be dynamically flexed, this step may be precluded for reasons related to mechanical reli - ability—a topic that will be discussed in a future col- umn. In short, this general technique requires that the entire manufacturing and assembly process be given some consideration before progressing. In summary, the decisions made by the flex circuit designer when laying out a flex circuit will have an impact that lasts the entire pro- cess. 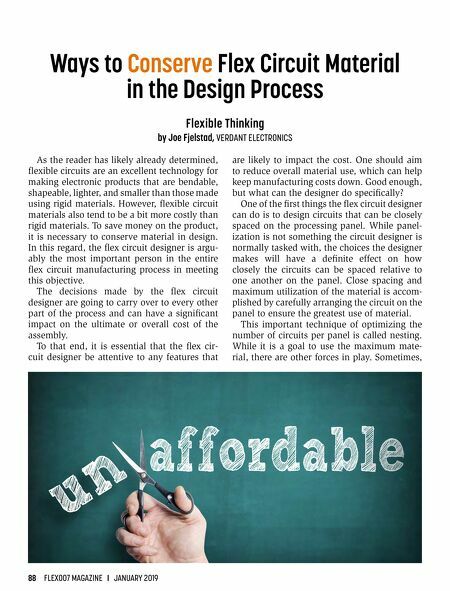 By considering how the circuit might fit onto a panel before submitting the design to a manufacturer, it may be possible to save a considerable amount of material and money. Not all designs will allow such freedom, but it is worth keeping in mind for those applications where the benefit can be secured. Proper circuit nesting can greatly improve panel yield and lower overall cost. If folding can be tolerated as an assembly operation, yield can be maximized. For dynamic flex cir- cuit designs, the grain direction requirement may impact layout. FLEX007 Further Reading For more detailed discussions on this and other flex circuit topics, download your free copy of Flexible Circuit Technology, 4 th Edition here. Joe Fjelstad is founder and CEO of Verdant Electronics and an international authority and innovator in the field of electronic interconnection and packag- ing technologies with more than 150 patents issued or pending. To read past columns or contact Fjelstad, click here. Figure 1: Options for flex circuit nesting to maximize material usage.